Being a beeswax candle-maker is a privilege. 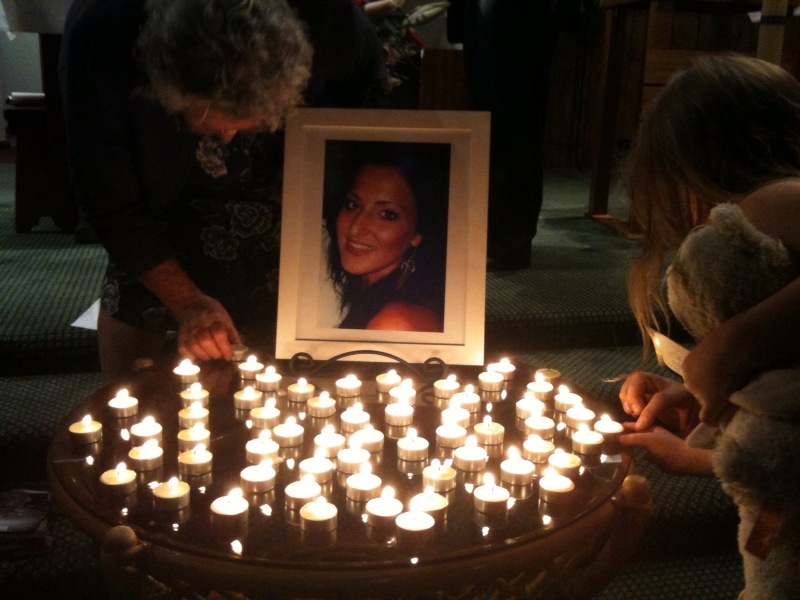 We get to light many occasions – from births to funerals and many moments in between. There is hope, comfort, serenity, dreaming, tranquility and light in every flame. It was pointed out to me by Dea’s mum, who sent this photograph to me, that she noticed on the day that the flames from each of the Queen B tealights were all leaning towards Dea’s photograph… what clever little candles and what an extraordinary universe. I can’t even begin to imagine the pain of losing a child. My heart aches even thinking about it. If we can provide even a modicum of comfort then we’ve done something worthwhile. This is our reason for being. I am simply a medium for channeling the miracle of the work of bees, and the hard work of our beekeepers into candles that light up people’s lives and homes. In nature, a hive has one Queen, but in some ways, many ‘mothers’. In nature, the worker bees decide when they want to create a new Queen and the existing Queen lays the egg of her heir (well eggs usually and the first born kills the other unborn queen/s). These eggs are carefully nurtured/mothered by the worker bees. Oh, this post just got way off track – there is no talk of supersedure that I know of! What I wanted to do was to thank the amazing women who have made mothered me and nurtured Queen B and without whom the business would not be what it is. Queen B is a the ultimate team effort. 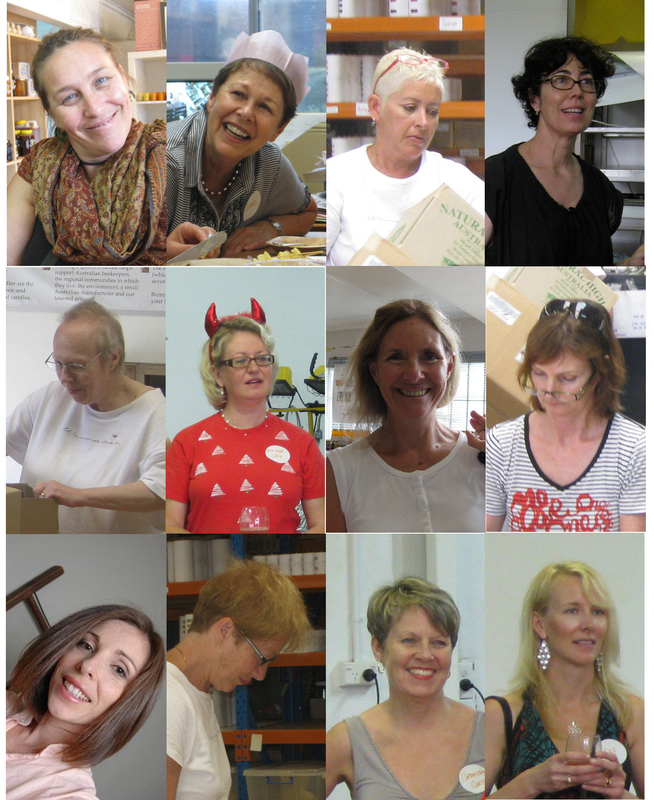 I love what we do and am passionate about the candles, but what gives me just as much joy is the women that I’ve met and the camaraderie amongst our angels who come to pack, package, tidy, cajole, love and support. Bees like to maintain a constant temperature of around 32 – 36˚C in their hive*. In an ideal world, I’d like that too! Last winter I failed miserably… we opened the roller door and slowly froze every day (apart from the 6 weeks that I naively turned on 4 oil heaters and ended up with a $3000 electricity bill). 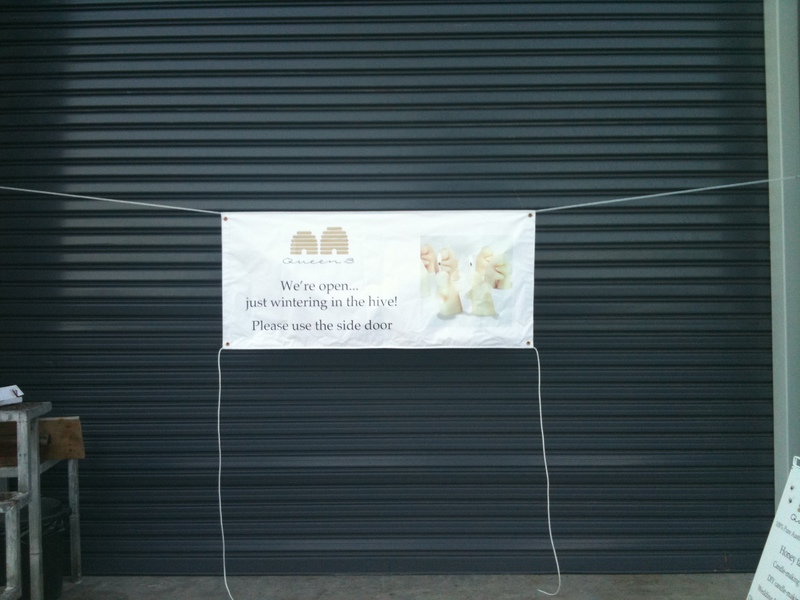 This year I decided that we weren’t opening the door in winter and had a small banner made so that customers still knew we were open and to use the side door. 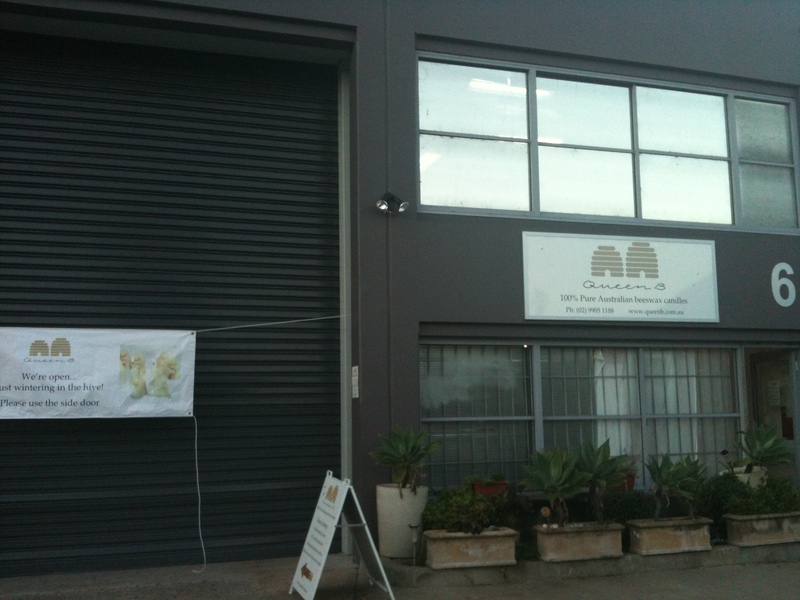 I was then told that I couldn’t affix anything permanent to the outside of the building to hang the banner from. My temporary measure (hanging it between two chairs!!) resulted in 5 phone calls on Saturday from customers who had come by and thought we were shut… “your rolled door was down”! I racked my brain all weekend (and brainstormed the issue with my friends at the hardware store) and today I solved the problem. Sometimes it is the smallest things with running Queen B that give me the greatest pleasure. Even after 10 years of making beeswax candles, I still marvel at the beauty of their light… the size of the flame… their golden light… no drips (no breeze!). The rest of the photograph is a study of a few of my favourite things. The lampshade in the background I made from leftover timber veneer strips found in the bargain bin at a hardware store. 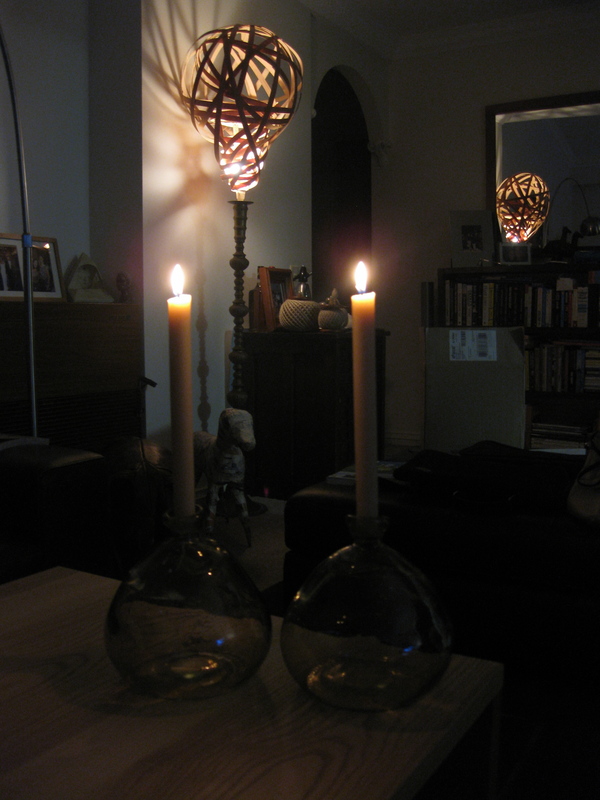 The candleholders are from Spain. The papier mache dog made by a talented friend. The antique twine bobbins. Photographs from my sister’s wedding.